Products For Sale | M. J. Mac Inc. Typically used in roof mounted applications where it is necessary to eject contaminated air away from a rooftop. 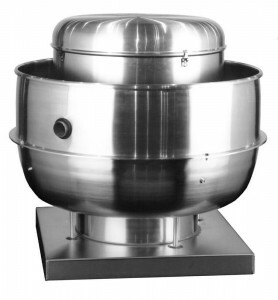 Description – Fan shall be a spun aluminum, roof mounted, direct driven, upblast centrifugal exhaust ventilator. Certifications – Fan shall be manufactured at an ISO 9001 certified facility. Fan shall be listed by Underwriters Laboratories (UL 705) and UL listed for Canada (cUL 705). Fan shall bear the AMCA Certified Ratings Seal for Sound and Air Performance. Construction – Fan shall be of bolted and welded construction utilizing corrosion resistant fasteners. The spun aluminum structural components shall be constructed of minimum 16 gauge marine alloy aluminum, bolted to a rigid aluminum support structure. The aluminum base shall have a one piece inlet spinning and continuously welded curb cap corners for maximum leak protection. The windband shall have a rolled bead for added strength. An integral conduit chase shall be provided into the motor compartment to facilitate wiring connections. The motor shall be enclosed in a weather-tight compartment, separated from the exhaust airstream. Unit shall bear an engraved aluminum nameplate. Nameplate shall indicate design CFM and static pressure. Unit shall be shipped in ISTA Certified Transit Tested Packaging. Wheel– Wheel shall be centrifugal backward inclined, constructed of 100 percent aluminum, including a precision machined cast aluminum hub. An aerodynamic aluminum inlet cone shall be provided for maximum performance and efficiency. Wheel shall be balanced in accordance with AMCA Standard 204-05, Balance Quality and Vibration Levels for Fans. Product – Fans shall be models ACRUD, ACRUD-EC, ACRUDEC-HP, ACRUDEC-XP, ACRUD-HP or ACRUD-XP as manufactured by Loren Cook Company of Springfield, Missouri. by Loren Cook Company only.